Cardiff opted not to kick the first penalty they were awarded in this game at the Arms Park, perhaps a sign of conditions, their confidence in their own abilities or just against this opposition. It didn’t look particularly windy, but then Duncan Weir made the same decision on Edinburgh’s first foray – just – into the Cardiff half. The visitors first attacking spell was arguably more successful than the hosts in terms of the length of possession but likewise ended scoreless despite some nice passing by Sam Hidalgo-Clyne. However the young scrum-half also delivered the “flat” pop for Blair Kinghorn’s first try after 12 minutes and the lanky fullback made it through the defence to dot down. Weir converted quickly to deny the TMO a chance to intervene and Cockerill’s men were probably about where they wanted to be. Luck can be quite important in a game refereed by George Clancy, and Edinburgh had their share in the first half with a few flat passes let go (see above) and balls bouncing their way as Cardiff struggled to adapt to the pace of the game. It gave them a good spell of possession in attack but they also looked quite comfortable in defence, new coach Calum MacRae giving them a system that when they are all concentrating is very hard to breakdown. Cardiff would have been looking for a Nick Williams on Duncan Weir mismatch, but couldn’t force one. Despite plenty of whistle from Clancy it took until the 26th minute for Duncan Weir to have a pop at goal, the success giving Edinburgh a 0-10 lead. The defence once again did brilliantly to keep Cardiff out in the period leading to half time, but when the backline forced a turnover Chris Dean was snaffled as he tried to clear and the ball bounced back into Blue hands before a cross-field kick from Jarrod Evans was claimed by Josh Navidi for the try. It’s a clever move when the defence is scrambling wide as the kick receiver’s angle back in to the catch means he’s instantly cutting against the direction of the drifting defenders and it is hard for them to change especially if he is in the air and protected. Evans converted in face of a deadly serious chargedown attempt by Jason Harries who looks like he has serious gas. Darryl Marfo also had a decent first half for his new club, part of a dominant Edinburgh scrum where WP Nel once again held the whip hand. Overall, a decent first half where they took the few chances they had and looked, well, like they knew what they were doing. Glenn Bryce replaced Dougie Fife at half time which gave Edinburgh two options at the back in a game with plenty of kicking. Again though, Cardiff put their first penalty of the half into the corner. This time it came from a good shove by the Cardiff pack and a reversal of the trend from the first half. Another scrum penalty minutes later allowed Evans to even the scores up and the Edinburgh pack would not have been feeling quite so dominant. Right on queue, Cockerill brought on the front row replacements. Luckily the Edinburgh back row were having a strong game and they were continuing to influence the breakdown and the defensive workrate, which was huge across the team. Hardie was quiet with the ball but was tackling everywhere as was Jamie Ritchie while Bradbury took on more of the ball carrying. The decision to award him the captaincy seemed to have the desired effect on senior players like Stuart McInally and Grant Gilchrist who also looked like they stepped up a level. Another Weir penalty with half an hour to go gave Edinburgh back the lead. On 55 minutes they also made good on their first real scoring chance since the first try, a strong period of attacking where Ritchie was at the heart of the drives through the Cardiff defence. Harries couldn’t quite get free on the left wing but the ball came back inside and it led to Hidalgo-Clyne spreading it wide to Kinghorn on the right who popped it back inside to Chris Dean, who stretched through the tackle to dot down. The new front row at least restored parity at the scrum but Cardiff were still able to claim plenty of territory off the back of it. There was a moment of “last season” Edinburgh where an insecure ball at the back of a poorly defended ruck was kicked loose and only Ross Ford pouncing on it prevented further embarrassment, but generally they looked after the ball well. Fowles almost got a third try which might have made things interesting – there were enough close calls left out there in the second half for a bonus point – but his arm wasn’t quite long enough. Spurred on by this, Edinburgh somehow managed to pinch the ball at the ensuing scrum and attack again. This time, Weir’s grubber was snaffled by Navidi but a penalty gave the visitors yet another chance. Again they couldn’t capitalise on it with a score, but coming away scoreless was a rare black mark in a game where they made the most of limited opportunities. Should they be more able to create their own opportunities is a question for another time, as the Cockerill era got off to a pretty good start. Edinburgh last season were guilty of letting sides back into games they were winning. I am sure the fans will accept it if they’ve graduated to not scoring breakaway sevens tries in games they are winning; the backline blend will be one that takes a while to find. First game of the season, away win? We”ll take that. SRBlog Man of the Match: Most of the pack played very well and it was great to see John Hardie in fine tackling form, but Jamie Ritchie was the standout and outshone his captain Bradbury – who still played pretty well. Tackling tirelessly and punching holes with his carries, Ritchie also jackalled a vital breakdown turnover on 76 minutes when he must have been out on his feet. Ritchie could have a very fine season indeed if he continues on this form. Well both coaches and players alike certainly delivered on what they promised. It wasn’t flashy and at times our attack is still very laboured but we still created enough good opportunities. Harries was very unlucky not to score on debut, why did Ritchie pass so early?? Also unlucky with the bounce of the ball on the kick through, his overall play was good though and he will score tries in this league. Duncan weir had his best game in an Edinburgh shirt by far. Not only was his kicking excellent, but his overall energy was way up on what it has been in the past. Another season of performances would be just fine. Marfo did really well I though until the scrum sort of went awry at the start of the second half, not sure what happened there but like you say if he is our 4th choice in that position it’s some strength in depth. Kinghorn looked like he had really filled out this summer and that combined with pace and a big boot, he could have a great season this year but still early days of course. Finally hats off to the coaching team for the most organised Edinburgh side I can remember for some time. Tactics were spot on (I’m assuming they targeted the high ball as a Weakness with Morgan) and macrae has really sorted the D out. If we can defend like that this season we will win more than we will lose. Very early days though and won’t be getting ahead of ourselves that’s for sure but a very encouraging start with the run of games we have coming up it’s a big chance to build momentum. Peter Wright (who was hilarious in his critique of Clancy) alleged that the Cardiff front row weren’t driving straight, and the replays seemed to support his position. Although at times Edinburgh were very frustrating, that was a hugely improved performance and a solid, deserved win. The defence was excellent – and whilst Navidi took his try well, it came from a moment of stupidity from Deans – and the attack was improved, and Edinburgh really should have had another try or two. Kinghorn was generally very good, SHC looked sharp, the pack looked solid and wee Duncy played well, too. Jamie Richie would’ve been my MotM, as I thought he was excellent, as was Toolis when he came on. In stark contrast to that, CdP was barely noticeable when he joined the fray, and it wasn’t entirely clear why Bradbury was taken off. Clancy was terrible throughout – from calling that the ball had been transferred in the first line out when it hadn’t to ignoring a punch right in front of him to making some bewildering calls at the scrum to not penalising intentional knock-ons to… Christ, he was just awful. Cardiff should’ve been down to 13 men at one point, and Matthew Rees and Alex Cuthbert in particular were dirty. I mention this because despite Clancy’s epic ineptitude, Edinburgh still won (although they benefited from Clancy missing a forward pass! ), and last year I don’t think they would have. They definitely appear to be playing more as a team and they and the coaching staff deserve to be congratulated for making noticeable progress in a short space of time. OK, a good away win for Edinburgh, with occasional glimpses of stylish rugby, but there is still a lot that needs to be improved. Need to be quicker to the breakdown and much faster to get the ball away. 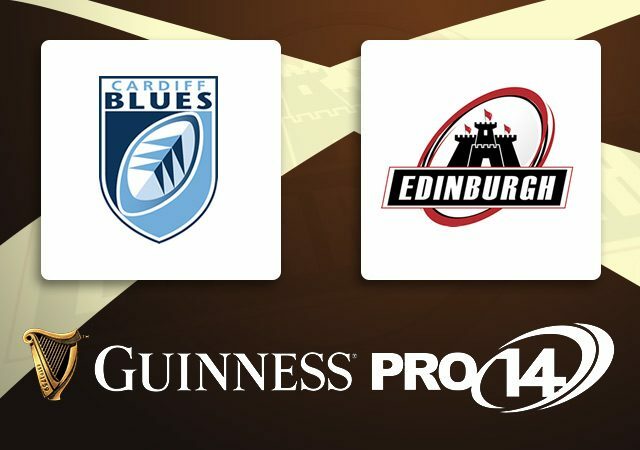 Cardiff did not play well, and Edinburgh’s old flaws cropped up often enough to leave two more scores on the pitch. I thought Edinburgh looked more physical from the start. Interesting to see Nick Williams after 15 mins sitting down after a tackle and shaking his head – felt like Cardiff didn’t enjoy the ferociousness of the Edinburgh tackling. It was similar for Glasgow tonight, multiple phases where they were knocking the opposition back over the gain line in defence. Hope this is something that the players can carry over to Scotland duty too! I was very impressed by Edinburgh. The back row all played well and Kinghorn looked a threat going forward. He still looks unsure in defence but he’s rounding out nicely. Cockers seems to have already brought a bit of dog into Edinburgh’s play so hopefully a better season ahead for them. Was good to see structure and belief from Edinburgh. Cardiff looked good in parts but overall pretty poor. Edinburgh still look a bit low on quality in the backs. Freuan and Bennet are needed badly and why have 4 out of the 5 Scotland fly half options at Glasgow I just don’t know. King horn looked good but doesn’t look anywhere near ready for international level based on Friday’s game. I just wish the Pro14 could draw a crowd. I had to force myself to watch this over the Exeter match despite supporting Edinburgh just because it feels so dead and flat. A backine of 9. SHC 10. Weir 11. Hoyland 12. Freaun 13. Bennet 14. Graham 15. Kinghorn . Provided the half backs and kinghorn stay on good form for the season and the centers stay injury free and fit that looks like a pretty potent backline to me for first season of cockerill. will be interesting to see how graham does in pro rugby. Although I am well on board the Darcy Graham hype train, I think we all need to remember he is still only a promising 20 year old player with precisely zero pro14 minutes. I hope he can make an impact this season, but let’s not go ahead and ink him in as first choice just yet! I’d assume D.Van Der Merwe would be 1st choice. I have to say this is probably the upset of the opening round of Pro14. Remember we lost 34-16 in the same match last year and lost at home to the Blues in February. All the other matches went to form, with the possible exception of Warriors winning away in Galway – always a hard place to win. But we shouldn’t underestimate the importance of this win against the Blues, at Cardiff. The performance wasn’t perfect – probably 6/10 in attack and 7/10 in defence – but better than the oppo in almost all aspects. It bodes well. Probably right Neil – I was a little harsh in retrospect but was probably allowing for the quality of the opposition.